Have you ever wonder why the bride carries a bouquet? Or why brides follow the saying, “Something Old, Something New, Something Borrowed, and Something Blue”? Or what was the original purpose of bridesmaids and groomsmen? For this week’s post, I decided I would research the origin of these traditions that we continue to do today. I was surprised to find out that many of these traditions have some very strange roots that seemed to revolve around evil spirits. The White Wedding Dress: Up until 1840 most brides would just wear the best dress they owned. It wasn’t until Queen Victoria opted to wear a white satin gown when marrying Prince Albert that the tradition of wearing a white wedding dress begun. Queen V’s edginess set off a trend that would continue to this day, 177 years later. The Wedding Veil: There are two origins provided for this tradition. The first, the veil was used to keep the bride hidden from evil spirits. The second, the veil was to keep the bride hidden from the groom until they were just about to get married. When marriages were arranged a long time ago, the bride and groom usually didn’t meet until they were standing at the altar getting ready to get married. The bride’s father feared that if the groom saw his bride before getting married and he didn’t like what he saw, he’d run away. The veil was a preventative measure to ensure that didn’t happen. The Bridesmaids: Bridesmaids initially were required to dress like the bride to confuse evil spirits on the day of the wedding. The Groomsmen: I thought this to be the rather interesting. Back in the day, the groom would kidnap his bride from her family and to do so required he take his best men with him, best swordsmen that is, to help fight off the family. The Brides standing to the left of the Groom: This tradition piggybacks off the last. The Groom would need his right hand free because that would typically be his sword hand to fight off family members or other potential suitors trying to take the bride back or steal the bride away. The bride still stands to the left of the groom even though swords are no longer required in most marriage ceremonies. 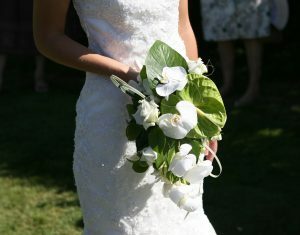 The Bridal Bouquet: The origin stems from olden days when brides would carry a bouquet of garlic and herbs to either (a) Ward off evil spirits; or (b) Cover up the stench of themselves because showers were not invented in those days. 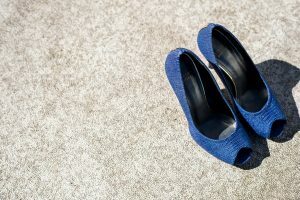 Something Old, Something New, Something Borrowed, Something Blue AND a Sixpence in your Shoe: I didn’t realize the last part was involved in the saying before doing my research for this post. Each part is symbolic. Something Old: Represents the past and the bond between the bride and her family. Something New: Represents the couple, new beginnings, and their future together. Something Borrowed: The item is to be borrowed from someone in a successful marriage, and the idea is you are borrowing their happiness in the form of an object. Something Blue: Represents a bride’s faithfulness and loyalty. Sixpence in the Shoe: The item is tucked into the bride’s shoe, and it is supposed to bring the new couple wealth and prosperity. The Kissing of the Bride: In the Roman Era, the way legal bonds and contracts were sealed was with a kiss. Therefore, marriage was believed to be a form of a lifetime contract between two people and a kiss was a way to seal the deal so to speak. There was also a belief that kissing was a way for the couple’s souls to blend. The Carrying of the Bride over the Threshold: There was a belief in Medieval Europe that evil spirits lurked in doorways and that the bride was most vulnerable to these evil spirts through her feet. Therefore, the Groom would carry her over the threshold. Why wouldn’t the bride just wear shoes? I will never know. The Honeymoon: The term “Honeymoon” comes from a ritual from Ancient Germanic weddings. The newly married couple would drink mead which was a honey sweetened alcoholic beverage for 30 days after their marriage until the next full moon as weddings during this time would only be held on a full moon. It was believe drinking this would bring about fertility. All traditions have their roots from somewhere. I found it interesting that many of these traditions stem from the belief that evil spirits were out to wreck the bride and groom’s happiness. Given the era of which these views originated, brides and grooms could find themselves ill from any number of diseases or in dangerous life threatening scenarios. I am thrilled that these traditions have evolved over time, in particular, the carrying of garlic and herb bouquets. This entry was posted in Brides and tagged bouquet, brides, grooms, honeymoon, kissing, tradition, veils, wedding, wedding dress.